First off the Round of 16. This is the first Euro ever to have such a round. That’s what happens when you increase the number of teams from 16 to 24. Similar confusing format as the Women’s World Cup last year, if not the same. And here are my predictions with my picks for the winner in bold. Switzerland (Group A 2nd) vs. Poland (Group C 2nd): This makes it the first Euro for either team to qualify for the knockout round. This is also the first Euro Poland won their first game. Also who would’ve expected that draw to Germany? I believe further success will come Poland’s way as they have been excellent. Also Switzerland has never won against Poland. They may have drawn in a friendly almost a year and a half ago but Poland has always beat Switzerland. Wales (Group B Winner) vs. Northern Ireland (Wildcard: Group C): You could attribute Wales coming out on top because of Gareth Bale but it is a whole team effort. Also Northern Ireland knew how to deliver in their surprise win over Ukraine 2-0 which was enough to give them the berth here. The two have played each other eight times before with Wales winning three times, NI once and four draws. Their most recent match was a friendly back in March where they drew 1-1. I feel this will lead to a draw that will go to penalty kicks where Wales will win. Croatia (Winner Group D) vs. Portugal (Wildcard: Group F): Normally I would predict Portugal to win this, especially since Portugal beat Croatia the three previous times they’ve met. However you just have to watch the play of these two teams here to get a good sense who will win. Croatia has been playing brilliantly despite their games plagued by obnoxious flare-throwing fans. However Portugal has struggled in their lineup and they have not appeared all that together. In fact you’d expect a team like Portugal to qualify with more than just three straight draws. I will give it to Croatia to win. They definitely look like a team that’s on. Note: If Croatia wins, this will be the first Euro where Croatia wins a knockout game. France (Winner Group A) vs. Republic of Ireland (Wildcard: Group E): As host nation, France had to do well. However they already had a talented enough squad to take them through the first round. Actually many people are thinking France has what it takes to win. Ireland have to have the ‘luck of the Irish’ that they were able to qualify after their win against Italy. They had a tie and a loss and appeared in danger of heading out. It’s either the luck of winning or Italy just wanting to take it easy knowing they finished first in their group. It almost seems like a forgone conclusion for France to win. Besides their last loss to Ireland was all the way back in the 80’s. It’s fair to pick France. Germany (Winner Group C) vs. Slovakia (Wildcard: Group B): Germany won their group as expected. This was Slovakia’s first Euro so a chance for themselves to prove themselves in front of the whole continent. They did very well in tying England and beating Russia. You think they should be invincible against Slovakia, right? Not so fast! Germany may have beat Slovakia in three of the five times they met but their last meeting was a month ago in a friendly and it was SLOVAKIA that won 3-1. So I predict the game will go to a draw even in extra time. However I predict Germany to win on penalty kicks. I have a hunch that’s what it will come down to. The only sure thing about Germany is a blemish-free penalty kick result. Hungary (Winner Group F) vs. Belgium (Group E 2nd): A case of two teams. One is a team playing better than their country ever has. Another you could rightfully call the ‘comeback kids.’ However it’s better to say Hungary proved you can’t call them a ‘blast from the past’ anymore. Hungary has a team that’s ready to return their country to glory. However Hungary’s comeback is not immediate. It’s slow but sure. However I think the Round of 16 is the furthest they’ll be getting right now. Besides Belgium has never lost to Hungary in the times they’ve played each other. I predict Belgium to win. Italy (Winner Group E) vs. Spain (Group D 2nd): How about that? Two teams that have a stellar reputation in football. Two teams that had an embarrassing Group Stage ouster during the 2014 World Cup. Two teams that played very well in the Euro 2016 group stage. And only one will still be in the running and one other will be out in the Round of 16. There may be concern since both teams lost their last game. However Italy decided to send in some lesser-skilled players for their match against Ireland since they knew they’d finish first in Group E anyways. Spain on the other hand started brilliantly and ended up giving their 1st place ranking away to Croatia. The two have known to have a colorful rivalry with Italy last defeating Spin in 2011. However I think Italy will win in added extra time. England (Group B 2nd) vs. Iceland (Group F 2nd): England qualifying is not a surprise. Here in Euro 2016, they’re back in a familiar position. Iceland however has been the big surprise of the tournament with 1-1 draws against Hungary and Portugal and a last-second goal giving them a 2-1 win over Austria. The funniest thing is that whenever you see 25,000 Icelandics waving their flag in the stadiums, you’re reminded at least 5% of Iceland’s population is there. Yes, pound-for-pound Iceland has proven themselves in recent years to be the top football team in the world, especially during Euro 2016. However I think Icelandic luck will end here. England has only played Iceland once before and won but that was back in 2004. I’m sure England will win again here although definitely by a smaller margin. Croatia vs. Poland: Croatia is the best it’s ever been at a Euro as is Poland. Poland is actually the best it’s been in decades. However both Croatia and Poland have met five times in the past with Croatia winning three times and Poland once. I predict Croatia to win again but in added extra time. Wales vs. Belgium: Wales and Belgium have met ten times before with Wales winning three times and Belgium four. I predict this will go to a draw in added extra time and Belgium will win on penalty kicks. Germany vs. Italy: Traditionally Italy has been known as Germany’s ‘Achilles Heel.’ Germany has lost to Italy on many big occasions like the semifinals of both the 2006 World Cup and Euro 2012. However Germany turned the tables in a friendly three months ago and won 4-1. I predict Germany to win again here. England vs. France: A familiar rivalry. England has won in 17 of the 30 previous meetings. However the tabled turned for France starting in 1999 and the odds would be in their favor with wins or draws. However England got back their advantage back in a friendly in November and won 2-0. I think however France will have the advantage with the home crowd. And there are my predictions for the first two knockout rounds. That’s how I see things but I know there will be at least one surprise or two. Pele has always said “Football is a box of surprises.” Expect to see some here in the next few rounds. And I’ll see you all again in the semis. Euro 2016 has made headlines for a lot of good memorable play. It’s also made headlines for the worse for hooliganism from Russian and Croatian fans. However starting tomorrow, all 24 teams have one last game to play. Three teams have officially qualified, one is officially out and the other twenty are still relying on the last game to decide it all. Here’s the breakdown of the teams that made it and the teams still with one last chance. Note only teams guaranteed qualification have their names bolded. Okay, it’s safe to say that by now, two wins guarantees you’ll be playing in the knockout round no matter what happens in the third game in any group. France is already guaranteed to move on after their wins against Switzerland and Albania. However they’re not guaranteed first place in the standings. Switzerland could take France’s top position away if they beat them. Chances are slim but still there. If Switzerland doesn’t win, they do have strong chances of finishing second despite what happens in the Romania-Albania game. Romania would need to have a win of at least 2-0 or 3-1 over Albania and Switzerland will have to endure nothing more than a loss to France if they can take second place in Group A.
Albania may have lost both of their games but they are not out. They still have a chance of qualifying if they defeat Romania. It will have to be nothing less than a win for Albania and even then they will have to wait until all the groups have finished and have all the third-placers ranked in order to determine the four that qualify. It’s what it all boils down to in this wildcard race. This is unique because none of the teams in the group are guaranteed of qualifying. That’s a good thing because all four still have a chance leading up to their last matches on Monday, June 20th.England currently leads with a win and a draw with Wales and Slovakia with both a win and a loss. However they could drop to third place if Slovakia beats them and Wales beats Russia. I’m sure England wouldn’t want that embarrassment. Slovakia and Wales can qualify even if they draw Final results of who ranks where will have to be decided in the final game. One thing is certain: if Wales and Slovakia both win, draw or lose, Wales will have a higher ranking because of their win over Slovakia. Even if Wales lost to Russia on Monday, they would still have the advantage of finishing at least third. Now onto Russia. Russia has had a lot of bad publicity because of their fans’ hooligan actions. UEFA has even dealt them a blow of a fine of 150,000. In addition, they face difficulty with their play as they sit with just a draw and a loss. Russia can still qualify but they will need nothing less than a win against Wales to do so. Germany currently at the top is no surprise. Germany’s scoreless draw against Poland was to many. Except me because I anticipated them to draw: albeit a score of 1-1. No doubt about it, this is Poland’s best Euro especially since they achieved their first ever win. Germany leads Poland in goal differentials should both Germany and Poland win, lose or draw on Tuesday the 21st.Poland could still clinch the lead over Germany but they would have to win over Ukraine and Germany draw over Northern Ireland or Poland draw and Northern Ireland win. Northern Ireland will need nothing less than a win over Germany to rank second at the very least. They are guaranteed a third-place finish but they will have to rely on win-loss stats and goal differentials of the other third-place teams to see if they are one of the wildcard qualifiers. As for Ukraine, it’s over. Even if they did win over Poland by even the hugest margin, their Euro 2016 trip will end Tuesday because their loss to Northern Ireland on Thursday put them in last place in Group C. For those that don’t know, head-to-head results override goal differentials at the UEFA Euro while it’s the opposite for the FIFA World Cup. That’s how things work here. It’s official that Spain is advancing to the Round of 16. Their wins against Turkey and the Czech Republic solidified their chances. However they could still finish second in the group. That can happen if they lose to Croatia. Croatia sits in second with a win against Turkey and a draw to the Czech Republic. Croatia is comfortable enough that they’re guaranteed finishing third at least. A draw will give them second place. A loss could still keep them in second but it would have to be a small loss to keep them in second. They wouldn’t want the Czechs to win big against Turkey. The Czech Republic will need a win if they are to advance. A draw will not cut it because of possibly falling short in the wildcard ranks. Meanwhile Turkey is not out either. A win will put them in third place with the possibility of qualifying. It will all be decided Tuesday the 21st. It’s now official that Italy has guaranteed qualification to the Round of 16. Its wins against Belgium and Sweden assured them a spot in the next round. Actually Italy has been guaranteed first place because even if they lost to Ireland and Belgium won, they’d have the advantage over Belgium because of their 2-0 win. Belgium’s win over Ireland brought their chances back. They could still qualify if they drew against Sweden. However a loss could endanger their chances of qualifying. Simply put, Sweden and Ireland need nothing less than a win to qualify. A draw for either wouldn’t cut it. Hungary is the team on top right now thanks to the group’s only win: against Austria 2-0. Every other match was a 1-1 or 0-0 draw. Hungary can still advance with a loss to Portugal because of their win over Austria. Iceland and Portugal have two draws but Iceland leads because they scored more. Already Iceland has their best team ever and they keep on breaking new ground each time, even if their two Euro games are 1-1 draws. I’ll bet Portugal was shocked to find out how good they were. Iceland would have to win over Austria in order to advance but Austria needs nothing less than a win over Iceland for their chances as they’re the one team with a loss. And it’s all chancy for Portugal. A win over Hungary will give them qualification but a draw will put them in the tricky wildcard category. And there you go. That’s the team rundown before they play their final preliminary game. Just like in FIFA tournaments, the third games for each group will all be played simultaneously. Hey, it’s do or die. Yep, I had my ticket ready! Normally you’d expect me to make quarterfinal predictions today. I made my quarterfinal predictions same time as my Round of 16 predictions. Actually I made a recent edit on my quarterfinal predictions since I got two wrong. Check the edits here. 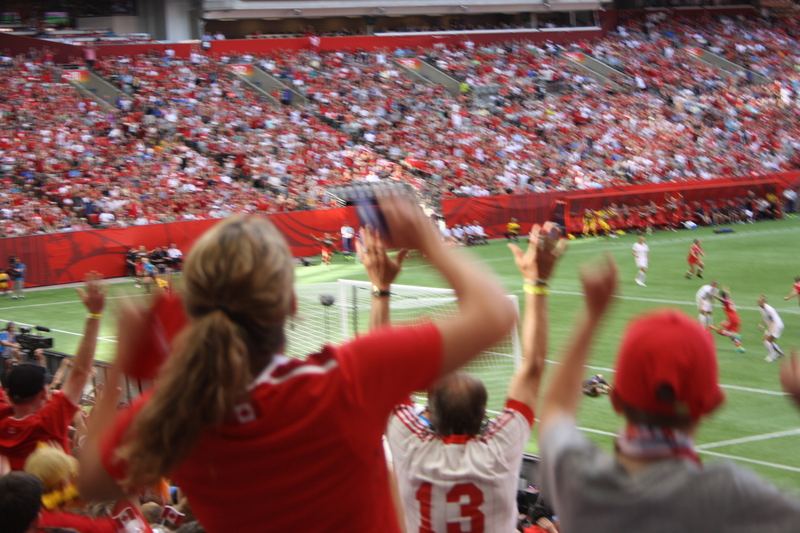 In the meantime I’ll tell you all about my experience seeing a Women’s World Cup game. 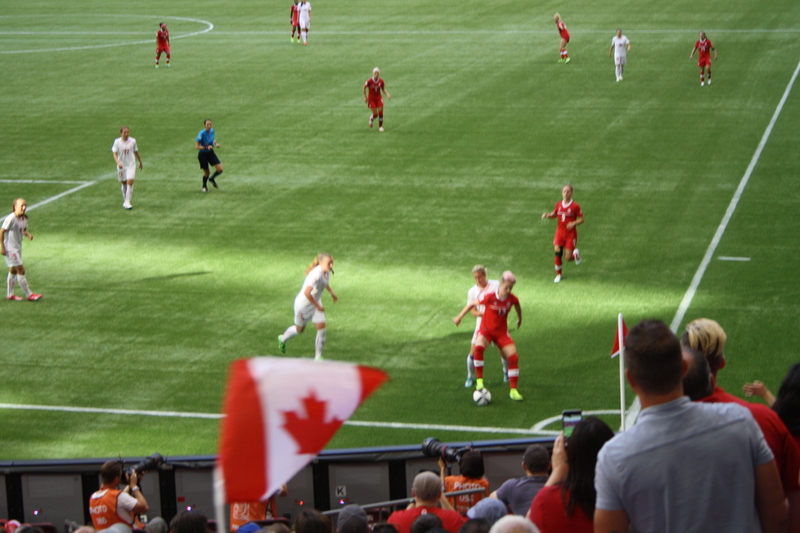 It was Sunday, June 21st–Father’s Day in North America– and I was to see the Canada vs. Switzerland game live at BC Place. This day was three weeks in the waiting for me. 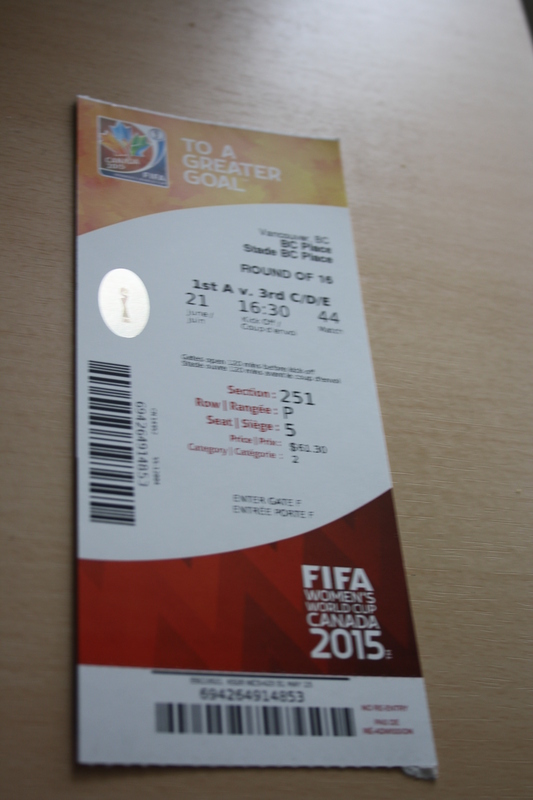 I bought the ticket during the Trophy Tour with the hopes that Canada would be the team to play. It seemed right. The berth was to go to the team that finished atop Group A and Canada looked like it had excellent chances. However I know there are no guarantees in sport. When I bought the ticket, I had the attitude that if Canada doesn’t play this, I’d still see it as this is a once-in-a-lifetime event. I paid very close attention to how Canada was playing here. Yes, I was nervous after the draws but Canada did top their group and did become the team I wanted to see. It was also a chore to see who Canada’s rival was. I knew it would be the third-place team from either Groups C, D or E. Wikipedia explained the match allotment for the third-place teams. Over time it was decided it would be Switzerland. I was confident Canada would win this. I heard two different sides of things as far as stats go. One was from Wikipedia; Canada has played Switzerland five times and won four. Another was from FIFA.com; Canada never played Switzerland before. What’s up with that? I got off at the Stadium Skytrain station 45 minutes before the start of the game. Just as I was walking up Beatty St. to the stadium, you could tell the crowds were getting bigger. The streets had banners of the WWC. 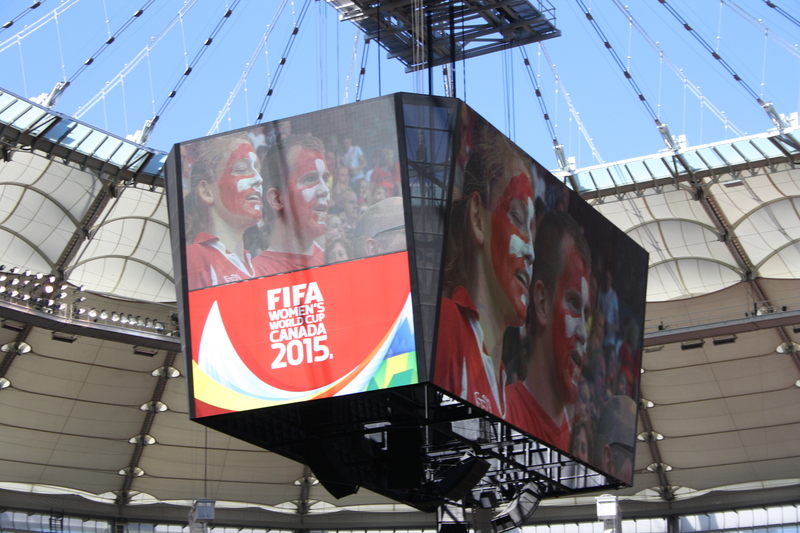 BC Place had decorated their walls with the WWC images. By the time I arrived at the main entrance at Gate A, there was already a load of people trying to get in. Of course there were a lot of Canadian flags and people with their faces all painted. The most I wore that day was a Canada shirt that said ‘Strong And Free.’ Yeah, I kept my fanfare conservative. Despite the long lineups there, I tried making my way to Gate F as my ticket said ‘Enter Gate F.’ I made it past the lineups at Gate H and Gate G but saw any access to Gate F blocked off. Fortunately I saw someone in the lineup of Gate G who said they also had the same instruction as mine did. I took Gate G instead. Security wasn’t too much of an issue. They did have to check bags. It was a typical routine stadium check. It’s not like the Olympics where entering the event is like going through an airport. Once inside BC Place, I wanted to do some looking around and see what they had up for the World Cup. Not too much except they did have WWC images in the walls and they had the WWC take over the stadium confectioneries charging their own prices which were way higher than during any Lions game. This was the first time I had to spend over $5 on a pretzel. I didn’t even have to spend that much during the Olympics. There were even WWC souvenir vendors. It was mostly T-shirts and scarves. I was hoping there would be something like glassware or spoons to give my parents as gifts. I wanted to look around, see the shops, see the fanfare. I even wanted to spot a few Swiss in the crowd. I was fortunate to do so. The crowd was packed full of Canadian fans. I made my way to my seat in good time: 25 minutes before kickoff. At first the stadium didn’t look all that filled but it would build over time. Both the Canadian and Swiss teams were training on the field. Then they had to make way as someone was driving a sprayer over the field to spray water. I thought that was odd. Spraying water on artificial turf? Actually I think they did that so that players wouldn’t sustain the dreaded injuries feared before the start of the WWC. Yes, there were some Swiss fans there too. Then it was game time. Interesting how you’re trying to watch a game and take a lot of pictures at the same time. I was seated near a net. During the first half, it was Canada’s to save and Switzerland’s to challenge. During that time, I was able to watch some good defensive skills from Canada but I was also watching in fear. Any miss could lead to a goal from Switzerland. 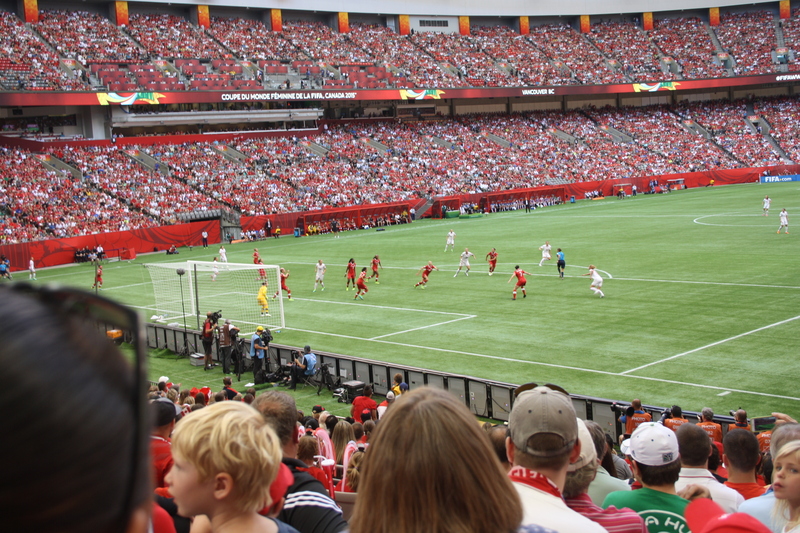 Over at the other end, it was Canada’s domain to score and it was hard to watch from where I was sitting. Often I had to look up to the jumbotrons to see what was happening. One thing I did remember seeing from that far away was Christine Sinclair getting a yellow card. The ref’s yellow card was enough to notice from 80 metres away. One thing to note is that I heard a lot of people saying that there was a lot of terrible reffing in this game. It was interesting trying to take pictures. I didn’t have my mode set on Sport so I ended up shooting a lot of pictures that were blurrier than they should be. I did get some good action shots. The game always had me nervous whenever the Swiss (in white) were on the attack. At the end of the first half, the game was scoreless. Canada and Switzerland did attack and did challenge at times. I decided to remain in my seat. There were some players out to train. The sprayer came out again. And Shueme came out to greet the crowds and get pictures from fans. Then the second half started. Things switched around this time. The net I was near was now Canada’s to score and Switzerland’s to defend. However it was only a matter of seven minutes when I was able to witness the goal from Josee Belanger. The crowd erupted! Actually it was hard to see with everyone standing up to cheer. Even I did. The crazy thing is that right after I sat down, I accidentally put my hand on top of the covered beer of the person next to me, causing a puncture and some spilled beer. She didn’t complain. She even gave me some popcorn to munch on. As for the goal, it was hard to see the actual goal so I had to rely on video replay to see it performed. Belanger delivered when it mattered. Belanger was also the most active Canadian striker that night delivering five of Canada’s seven shots. That goal gave the crowd enough positive energy to start a wave! Yes, this is how I saw Belanger’s goal. One thing about the game is that I was able to see some crazy injuries from where I was. I saw on where Christine Sinclair was lying on the ground. Fortunately she was able to get up. However Melissa Tancredi was less fortunate. She was lying on the ground in pain and yes, she got up but she was limping around and a substitution was needed. Actually both teams went all out and used all three of their substitutions. Canada (in red) hasn’t been scoring an awful lot of goals but their defence has delivered each and every time. Then the final whistle blew. Canada won! Their first win of a WWC knockout game since 2003 and it made Canada the only other host nation of a WWC besides the US to win a knockout game. The whole stadium was cheering. The whole team gathered to celebrate. Coach Herdman of course was happy. Goalkeeper Erin McLeod was declared the Woman Of The Match. Then the whole Canadian team took their victory lap. This was a great day for Canadians to be happy. Canada wins! They’ll be staying in Vancouver for their quarterfinal. I have to say that watching a football game live is different than watching it on television. It’s exciting to see the action close at you but when it’s far away, it’s hard to tell what’s happening and you have to rely on watching the jumbotron to know what exactly is happening. There were many times I wanted to get some pictures of Coach Herdman and his reactions but my zoom lens wasn’t good enough. It wasn’t even good enough when the action made its way to the other end of the stadium. I’m just glad Canada’s goal happened when I was close by. The interesting thing I noticed about the crowd during the whole game is that you didn’t see the typical lunatic fringe type of crowd you’d normally see during soccer games in Europe or South America. Makes you wonder what the difference was. Was it because it was a woman’s game? Or because it was held in Canada? 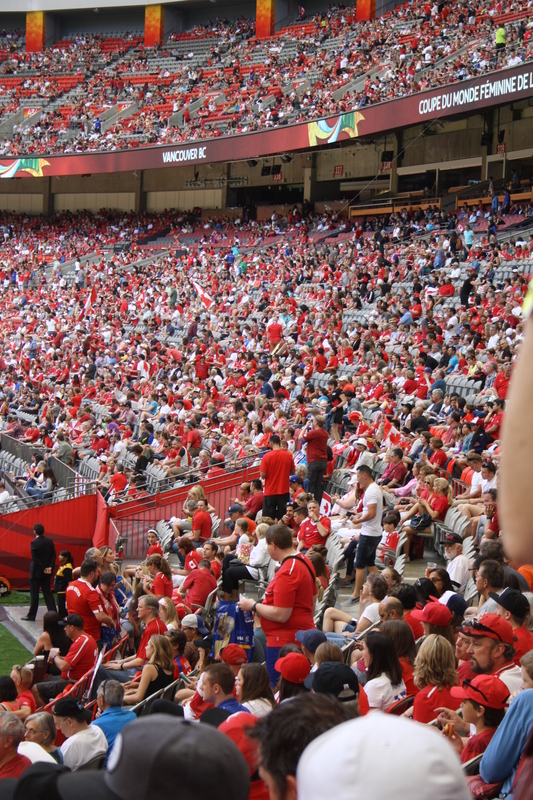 Sure there were people cheering loudly, the whole stadium was cheering for Canada and there were the occasional musicians in the crowd but there wasn’t that loud boisterous fanfare you’d normally hear at men’s World Cup games. I even watched the final of the U-20 World Cup that was contested in New Zealand and even there you heard the loud boisterous cheering you’d come to expect from a soccer match. 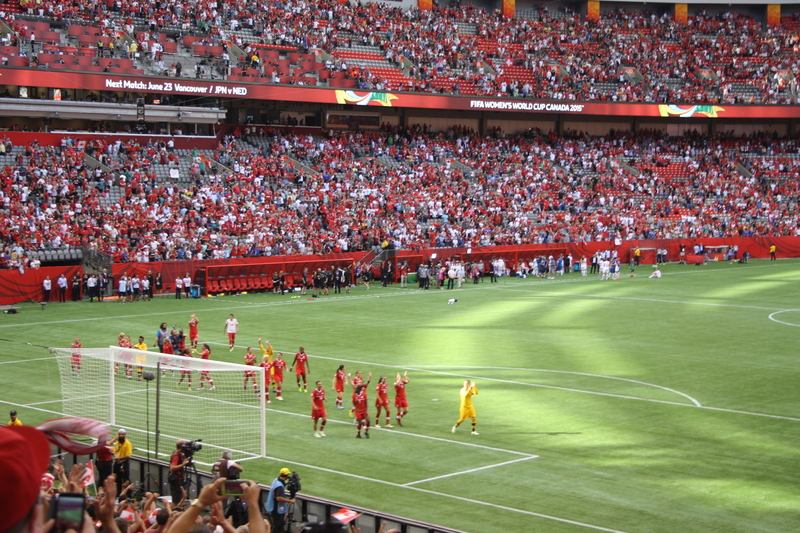 The Canadian team took their victory lap around BC Place. Nevertheless it was still a good event. The cheering may not have been loud or full of musicians but it was very supportive and passionate enough. That’s especially what I like best about this Women’s World Cup. Every men’s World Cup, Canadians always cheer for another country; most likely the one of their ethnic background. Canada has only qualified for the men’s World Cup in 1986. I don’t think there’s anything bad about what we do but it got on my nerves when I saw tweets and videos from Americans cheering for the USA. They’re not cheering for the country of their ancestry. They’re cheering for the USA! Knowing that cheesed me off. Here we can finally cheer for Canada! Now when I bought the ticket back three weeks ago, I bought it as my best chance to see Canada play. I did not buy a ticket for the quarterfinal her in Vancouver which the winner of the match I saw would play in. I have to say I don’t mind. Sure, it would have been nice to have a ticket to see Canada play England in tomorrow’s game but I still have the satisfaction knowing I saw Canada play at the World Cup. Even better satisfaction that I saw Canada win. If they win tomorrow, great. I won’t be jealous of those who do have tickets. I had my time on Sunday and tomorrow will be their time. So that was it. My very first World Cup game of any kind.You can forget about me having a ticket for the final. They all sold out long ago. Nevertheless it was a good experience and I’m glad I had the chance. That’s one item to cross off of my life’s ‘To Do List’ and hopefully chase a ticket or two for the men’s World Cup in the future. The Group Stage has been contested over the past two weeks. Some results did go as widely predicted and some were surprises. Who thought Cameroon would come second in their group? Who thought Colombia would beat France? And who thought Group D would be that close? A group with three teams in FIFA’s Top 10 would be a tough group. Whatever the situation, the 24 at the beginning had to be reduced to 16 and now that it’s decided, it’s off to the knockout rounds. China (Group A 2nd) vs. Cameroon (Group B 2nd): This is a hard one to predict since neither team have played each other in the past. China is performing well especially for such a young team–for the record no Chinese player is older than 26– but Cameroon have been pulling some surprises. They won 6-0 against Ecuador, beat Switzerland and was the only team to score a single goal against Japan. I will have to predict Cameroon to win this match because of the excitement they’ve been delivering in their performances. USA (Group D Winner) vs. Colombia (Group B/E/F 3rd): Colombia has been one of the surprises of the Cup so far but I believe this is where their magic will come to an end. The US are tops on talent and experience. Colombia have accomplished a lot here but they’re still growing as a team while the US is among the top in the world. So that’s why I predict the US for an easy win. Germany (Group B Winner) vs. Sweden (Group A/D 3rd): If there’s one Round of 16 match that can deliver a surprise, it’s this match. Both teams are raked in FIFA’s Top 5 and both are capable of surprising the top countries. As for past stats, they’ve played each other three times before with Sweden winning twice and Germany once. However Germany has been playing brilliantly and powerfully and Sweden has drawn in all three of their games. That’s why Germany is my pick for this match but in extra time. France (Group F Winner) vs. South Korea (Group E 2nd): There’s not too much to build upon in terms of past results. They’ve only met once before with France winning 1-0. However I would have to make my judgment upon the teams’ game play here. France was excellent but did expose their weaknesses with their 2-0 loss to Colombia. South Korea is a team still learning and playing. With that in mind I will have to pick France. Brazil (Group E Winner) vs. Australia (Group D 2nd): How about that? Brazil was the first team to clinch #1 in their group after only two games. Shows that Marta and the girls are on target. Australia are also phenomenal as they’ve been playing with consistency by winning against Nigeria and drawing against Sweden. May make FIFA want to rethink their current #10 status. However even though Australia want this to be the World Cup where they finally win a knockout game, I don’t think the Matildas will win here. Brazil has played them eleven times and won seven. I have to go with Brazil on this one. Japan (Group C Winner) vs. Netherlands (Group A/F 3rd): Another pair that will meet together for the first time at this World Cup. This is actually easier to predict. Japan has been dominating while the Netherlands are learning and getting better over time. However I don’t think they will have enough to defeat the defending Cup champions. I believe Japan will take it. Norway (Group B 2nd) vs. England (Group F 2nd): One thing about the Three Lionesses is that some people on Twitter are saying they can teach the men a thing or two. England has been brilliant this tournament but Norway has proven themselves great performers too. Their ‘blast from the past’ thing seems to be just a myth and are able to prove themselves again. Predicting this game won’t be easy especially since they’ve only played each other once before and Norway won 2-0. For this, I will have to go with England in extra time. Norway has shown improvements over time but I don’t think it will be enough here. Canada (group A Winner) vs. Switzerland (Group C 3rd): I will have to be frank and honest here. I’m happy of Canada’s progress but judging by their play over the past few days, I don’t think they’re playing like they deserve to win the Cup. They will really have to step up their game if they want to win the World Cup or even progress further. Basing a prediction on head-to-head play only adds to the confusion. Wikipedia says they’ve played each other four times with Canada winning three while FIFA says they’ve never played head-to-head ever. As for Switzerland, they’re getting better. This is their first World Cup and they’re improving. However I don’t think they’re at the same level of play as Canada. That’s why I predict Canada to win this match. And Canada better win! Because that’s the Round of 16 game I’m seeing! Germany vs. France: If you think Germany’s Round of 16 match against Sweden will be a nailbiter, the nailbiting won’t be over yet as I believe they will face France in the quarterfinals. However Germany has been next to dominant while France has shown in their loss to Colombia their reputation of choking at big meets. That’s why I’m leaning towards Germany. China vs. USA: China is a former great country in women’s football seeing to make a comeback. It appears their ‘young team’ has paid off because they have made it to the quarterfinals. However this is where I feel their comeback will stop. The US is more experienced, more familiar with being a dominator, and they know how to deliver. That’s why the US is my unanimous pick for the win here. Australia vs. Japan: Australia are the surprise of the tournament. Everyone thought Brazil would be the team in the Round of 16 but Simon seized the moment. However this is where the Matilda’s magic will end. I’m going to have to side with Japan on this one not just of how they’re doing now but of the last four years of head-to-head play. Australia and Japan have met many times but only won one game and that was back in 2010. Canada vs. England: Okay, both team played well but both showed weaknesses. England may have lost to France but they won against Mexico and Colombia. Canada won against China but drew their two other games. I feel this will be a tight match that will draw down to penalty kicks which will be won by, believe it or not, England. Hey, the English men may have a reputation of being complete rubbish at penalty kicks but the lasses may tell another story. And there you go. Those are my WWC predictions so far. 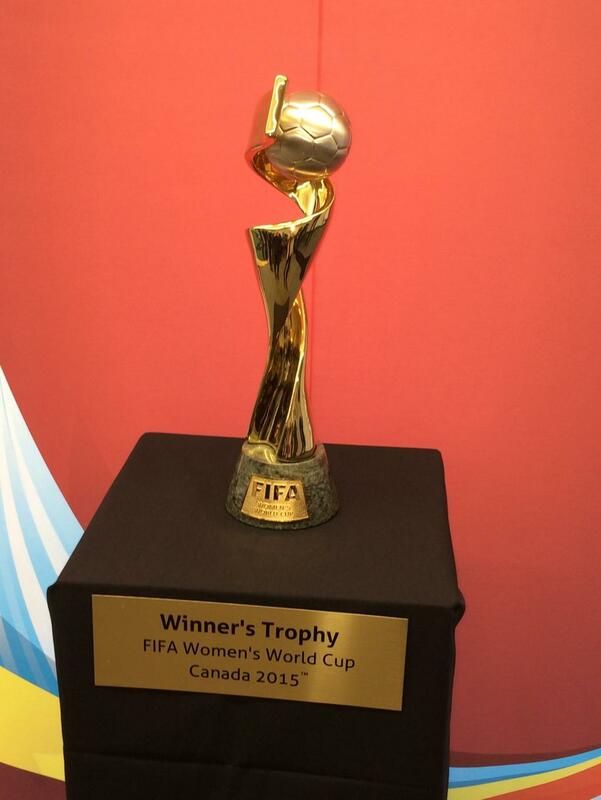 I have no plans to make any more WWC predictions until the semi-finals. Stay tuned until then! Canada leads but without a doubt they lack the dazzle they’ve been known to have. A 1-0 win over China and a scoreless draw over New Zealand may assure them first place right now but they’re not impressing the home crowd. Canada could still likely qualify even if they lost to the Netherlands but I don’t think they’d want to do that. China was able to get itself in after its win against the Netherlands. Actually both China and the Netherlands are tied as they both won 1-0 and lost 1-0. Their play in the next game will decide their fates. New Zealand still has a chance of qualifying after that scoreless draw against Canada but they need nothing less than a win against China if they’re to do so. This group is anyone’s game right now. Norway’s win over Thailand was not a surprise. Neither was Germany’s win over the Ivory Coast but the score was definitely a surprise. 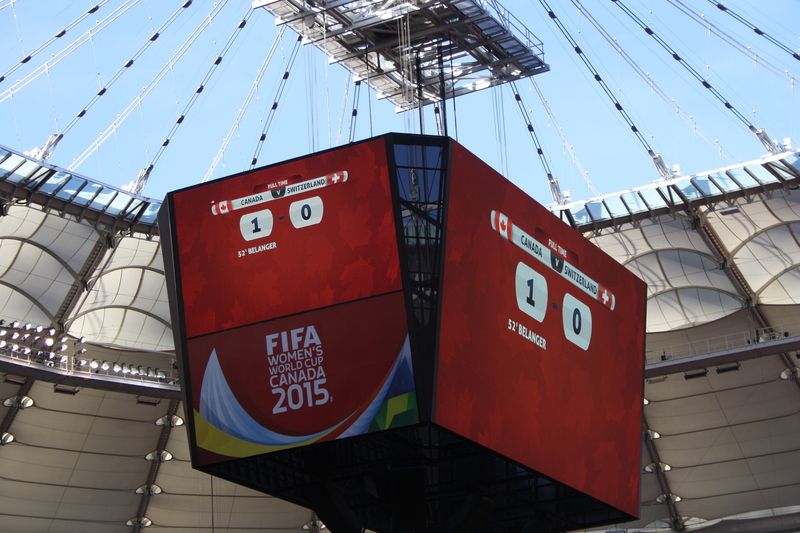 For the record, the 10-0 score is not the most lopsided victory at the FIFA WWC. That was achieved by Germany in 2007 in a Group Stage match against Argentina: 11-0. Germany and Norway drawing was a surprise. It’s not uncommon to see teams drawing after they feel they have a comfortable enough lead. Both Germany and Norway are likely to win their next games as neither Thailand nor the Ivory Coast seem like a challenge to either of them. Thailand could still have a chance if they draw against Germany but that’s unlikely. That would have to draw down how they’d rank against the third-place teams. Ivory Coast doesn’t appear too likely to qualify as they will play Norway next. Japan is definitely progressing. Their two wins secured it for the defending Cup champions. They will highly likely come in first as their last match of group play will be Ecuador and it looks most likely to be a win. Both Switzerland and Cameroon have lost to Japan but they were able to profit off of play against Ecuador. Switzerland had it best with their 10-1 win on Friday. If they both tie in their final game, both will qualify because of goal differentials to their advantage. The win of course would decide the second place team in the group. Of course Ecuador is out. As I said in my group blogs, there are some countries that don’t have a chance of progressing or winning and this World Cup is their opportunity to learn and hopefully grow in the years to come. As you probably read in my blog, I had a feeling this group would be the ‘Group Of Death’ and it has already delivered some surprises. The first being the 3-3 draw between Sweden and Nigeria. The second being the scoreless draw between the U.S. and Sweden. The U.S. will qualify no matter what happens against Nigeria. All three other groups’ fates will be decided in their final game. As of now, all three have a chance. Nigeria could get in if they beat the Americans. Australia could qualify upon a draw against Sweden but Sweden needs nothing less than a win to qualify. Brazil is already guaranteed to finish top of their group with their two wins against South Korea and Spain. Even if they lose to Costa Rica, which highly won’t happen, they have enough game points to finish on top. Neither of the other teams have even a single win and that means second and third is anyone’s game. Costa Rica could still qualify if they tie Brazil though that may not be too likely but if they do, they would have to rely on the third-place team rankings to see if they made it. They have an advantage over teams that would have a win and two losses because of even goal differentials. South Korea and Spain both still have a chance but either team has to win if they want to qualify. A draw won’t cut it as there are at least four third-place teams with at least a win. This is another group with surprises. At first I thought Colombia didn’t have a chance of qualifying but right now they’re the Group F team that’s assured of advancing. It was their 2-0 win over France that did it. That leaves favorites France having their fate decided in their game against Mexico. England however received an advantage after their 2-1 win over Mexico. That kept them in contention of qualifying with their match against Colombia to decide it. Both France and England can advance by simply drawing against their opponents but there’s no question they’d want to win with their reputations as women’s football leaders in Europe at stake. Mexico however needs nothing less than a win in order to advance. They’re lucky as their goal differential is actually quite small. Nevertheless it’s interesting to see that this group best demonstrates the progress of women’s football in countries of Europe and Latin America. And there you go. That’s what’s needed in terms of advancing to the Round of 16 starting on Monday. I’m sure it will be crazy shifting your attention from one game to the other but don’t worry, the other will eventually get replayed. The Group Stage was held these past two weeks for the same reason time and time again at each World Cup: to separate the contenders from the pretenders. There were some surprises both in terms of who qualified and who were ousted. The big name countries that were ousted were some of the biggest news. Nevertheless those that qualified got their moment in the sun. Now begins the knockout rounds to determine the two teams in contention for the Cup. However the first round of the playoff stage will be the Round of 16. The Group Stage not only decided the two advancers from each of the eight groups but also determined who plays who in the knockout stage. Heck they’ll even go to the ever-dreaded penalty kicks to get a winner. One thing about this phase is that it’s organized so that neither of the two qualifiers from the Group Stage meet again until they are both lucky enough to both reach the final. -Brazil (Group A 1st) vs. Chile (Group B 2nd): Brazil and Chile sure have a habit of meeting each other at the World Cup. First time was in 1962 in the semifinals when Chile was host nation. Brazil won 4-2. Next time was in 1998 in the Round of 16: Brazil won again 4-1. The next time was in 2010 again in the Round of 16: Brazil won again 3-0. Look who play in the first Round of 16 match? In terms of looking at the teams, Brazil has been excellent but has a habit of slowing down when they shouldn’t. Just ask Mexico. Chile has been very good and proved they can rise to the occasion against even the heavy favorites like Spain. Netherlands however gave them a reminder how they still have a ways to go. My prediction for this round will be Brazil to win. No way is Brazil going to lose in front of their home country. Not with the memories of the Maracanazo in mind. Yes, I’ll post that flashback soon. NOTE: One thing I’ve noticed is that every first-game of the Round of 16 begins on a good and often thrilling note. I still remember USA 1994 and seeing the first Round of 16 match: Germany vs. Belgium. Three goals scored in the first fifteen minutes. Also a bit of trivia. The first Round of 16 game has never gone to penalty kicks. Let’s hope it stays this way this year. -Colombia (Group C 1st) vs. Uruguay (Group D 2nd): Funny thing about the first day of the Round of 16 is that it might make you think you’re watching the Copa America instead. Actually one thing about the South American countries is that they’re very thorough in their play against each other. While some continents contest a few countries against each other for a World Cup berth or even half the countries, all South American countries play each other twice to determine the qualifiers. Each of the countries know each other very well from the play. They know their strengths and their weaknesses. It’s possible that even the best South American team can be defeated by a South American team that doesn’t have the legacy or the higher FIFA ranking. Sometimes it makes you wonder if it’s harder to win a continental championship than the World Cup. Not just for South America but for all continents. Both Colombia and Uruguay have played each other a lot over they years. They’ve both won some and they’ve lost some. Uruguay has won more but Colombia has won more in recent years. My pick for the winner will be Colombia. However don’t be surprised if the match goes to penalty kicks to decide the winner. -Netherlands (Group B 1st) vs. Mexico (Group A 2nd): Most people at the beginning were writing the Netherlands off, especially from their three losses in the Euro 2012 Group Stage. They didn’t show much sign of improvement. That is, until they stepped on the field against Spain. There they reduced the defending Cupholders to size and continued with impressive wins against Australia and Chile. Orange magic was back. Mexico themselves had low expectations. However it took consistent play from them, and even proving to be a tough match for Brazil, to send the message they haven’t lost it. My pick for the win is the Netherlands. They have been a scoring machine since the start of the Cup and they don’t show signs of slowing down. -Costa Rica (Group D 1st) vs. Greece (Group C 2nd): Of all the pair-ups in this Round of 16, this is the only pair that has never played against each other even once before. Costa Rica has been the ‘Cinderella team’ of this World Cup so far with their wins against heavy favorites Uruguay and Italy. Greece has also had a ‘Cinderella’ moment here at the World Cup. With a loss and a tie, they appeared close to elimination before playing the Ivory Coast. However Greece had a surprise. And repeating their surprise from Euro 2012 when a win against Russia in their last Group Stage game, and also with a loss and a tie, helped them advance. I’ll have to go with Costa Rica because they’ve been better at winning here at the World Cup. But don’t rule out Greece causing a surprise. -France (Group E 1st) vs. Nigeria (Group F 2nd): France has impressed the football world with their comeback here at the World Cup. The 5-2 win over Switzerland sure showed Les Bleus are back. Nigeria is also another comeback team. They tied Iran, won against Bosnia and gave Argentina a good fight in their 3-2 loss against them. Nigeria advanced for the first time in 16 years and for the third time in their history, making them the first African nation to advance past the Group Stage three times. I’m normally one to rely on head-to-head stats. If I did, I’d pick Nigeria as they won their one head-to-head match. However I give it to France for their brilliant play they’ve been showing. -Germany (Group G 1st) vs. Algeria (Group H 2nd): Germany just keep on showing their consistency. The sixteenth straight World Cup where they advance past the Group Stage and the seventh straight World Cup where they finish the Group Stage #1 in their group. Algeria however are having their best ever World Cup. Their first World Cup where they advance past the Group Stage. It was a brilliant 4-2 win against South Korea that solidified their chances. Now the hard part. Predicting the winner. Normally I’d pick Germany because of their consistency and the fact they’ve made the Top 8 every year since 1954. However I’m reminded at the FIFA site that Germany has played Algeria twice before and lost both times. I’ll say Germany but don’t be surprised if this takes penalty kicks to decide. -Argentina (Group F 1st) vs. Switzerland (Group F 2nd): Argentina continue showing their consistency even though their wins have been lax. One thing is that Lionel Messi has come back and has scored four goals. Switzerland has been mostly consistent in their play and they didn’t let their 5-2 defeat from France bring them down. I pick Argentina and not just because of their play. FIFA stats show that Argentina and Switzerland have met six times before. Argentina has won four timed and they drew twice. I don’t think this will be the place Switzerland will get their first win against Messi and the boys. -Belgium (Group H 1st) vs. U.S.A. (Group G 2nd): Belgium is back. They’ve been questions whether they deserved their ‘seeded’ status during the draw but they’ve won all three of their games, even though with small results like 2-1, 1-0 and 1-0. USA keep writing new chapters for themselves. They deliver an impressive record in the Group Stage to qualify for the Round of 16 for the second time in a row. To think the USA used to be a joke in the football world. Not anymore. I pick Belgium. yes, the USA has shown they can put up a great fight with even the best of them. However I will rely on the head-to-head stats where the USA has beaten Belgium one time in the five times they’ve met. The last game they played was a friendly less than a year ago which Belgium won 4-2. For this part, I will assume the quarterfinal match-ups go with my Round of 16 winner predictions. -Brazil may not like this because they’ve had bad luck against France in the previous three World Cup meetings. I predict France because they’ve had better head-to-head play against Germany. I predict Brazil. At first many thought they’d crumble under pressure but they have poured it on against Croatia and Cameroon. Argentina’s won three of the four times they’ve played Belgium. It’s likely to stay that way here. Oranje and the Ticos have never faced each other before. However Netherlands is skilled enough a team to bring Costa Rica’s ‘Cinderella story’ to an end. Okay, I’ll save my actual predictions for the semifinals and finals once we learn of the true winners of the Round of 16 and the quarterfinals. My coarse predictions for the semis, should my predictions actually all turn out right, is Argentina beating Netherlands and Brazil finally beating France. Netherlands will win the 3rd-place match and Brazil will win the Cup. In the meantime, those Round of 16 and quarterfinals predictions are my actual predictions for now. Well here we go. Each of the teams at this year’s World Cup have played two of their three Group Stage opponents. Over the next few days they will all play their last opponent and the group results will be official. Two countries from each group will remain in contention and move onto the knockout rounds. Two others will have their World Cup dreams end right there. I’ll bet most of you thought that Brazil would be the first country to be guaranteed a berth in the Round of 16, right? So did I. The scoreless tie against Mexico still keeps things uncertain between three countries. The one certainty is that Cameroon will not move on even if they won against Brazil, which would highly be unlikely. The way it looks for the three teams in contention is this. With Mexico playing Croatia, Mexico can qualify by simply tying. Croatia needs nothing less than a win. Brazil can simply qualify by tying but do you think they’d want to do that after their scoreless draw to Mexico? This is the one group where both advancers have already been decided. Both the Netherlands and Chile have two wins guaranteeing them a spot in the Round of 16. It’s also guaranteed it’s all over for Australia and defending champs Spain with two losses each. Even if one of them won in their match on Monday, it would all be just for pride. That’s all they can muster now. I’m sure Spain will most likely want to win it as a last message about themselves. The match of Netherlands vs. Chile on Monday will be a case where it decides which team finishes first and which finishes second. Netherlands can end up #1 just by simply drawing against Chile because of better goal differentials. Chile must win this if it wants to claim the #1 spot in Group B. Besides I have a co-worker who’s Chilean and he wants Chile to win. He feels if Chile loses, they’ll end up facing Brazil in the Round of 16. And Brazil has cut Chile’s World Cup dreams short in the Round of 16 twice before: in 1998 and 2010. Colombia’s two wins over Greece and the Ivory Coast have guaranteed them a berth in the Round of 16: their first since 1990. The other three countries still have a chance. Japan could do it by winning against Colombia and Greece could do it if they win against the Ivory Coast. However it’s a case for either of those two nations that they have to win in order to qualify. And even if both win, it would depend on goal differentials to decide who qualifies with Japan having a two-goal advantage over Greece. Ivory Coast could advance just by simply tying Greece but it’s best guaranteed by a tie between Colombia and Japan.Ivory Coast could lose their chances if they tie and Japan has a win with a two-goal advantage. Or Ivory Coast could be out if they lose to Greece. So it’s not out for any of the four and the last games in Tuesday to decide it all. Admit it. When you’ve been looking at this group all these months, you were probably guessing which of the three: Uruguay, England and Italy will qualify. And I’m sure with good reason. All three have a World Cup legacy and all three have proven to be strong challengers today. Even I was fixated almost strictly on those three. I’m sure hardly any of us payed much attention to Costa Rica. I’m sure we all thought Costa Rica was the odd one out and wrote them off. They don’t have the same legacy of the three and even now they rank low in the world. Well guess which of the four in Group D is guaranteed to advance? Another definite thing is England will be out. 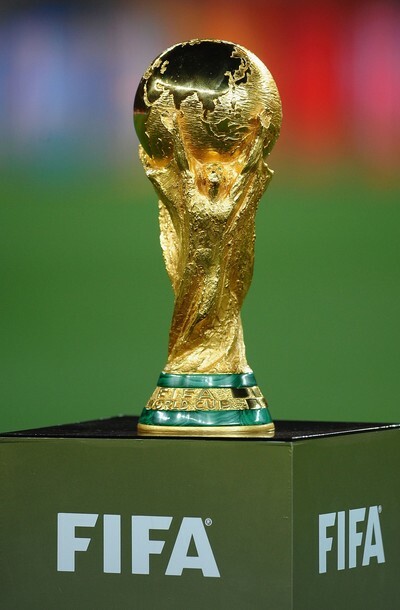 This makes it the first World Cup since 1958 that England will fail to advance after the First Round. It’s possible they could win against Costa Rica on Tuesday for the sake of pride but we’ll see. So the match of Uruguay vs. Italy will settle who the second advancer will be. Winner of course advances but if it’s a draw, Italy advances because of better goal differentials. So Uruguay has to win if they want to advance. Quite something how it will be two former World Cup winners from this group who will not advance. If there’s one country that wanted to make past embarrassments a thing of the past, it’s obvious it’s France. I’m sure most of you remember their embarrassments in 2010. The two wins from France–and big wins with 3-0 against Honduras and 5-2 against Switzerland–show that Les Bleus are back and have an exceptionally strong chance of advancing. The only way I can see France not advancing is if they lose badly to Ecuador (a minimum of 4-0 Ecuador) and Switzerland have at least a 5-0 win over Honduras. That’s how comfortable France’s chances are, though nothing is set in stone right now. The other option is which of the other country’s will advance. Both Ecuador and Switzerland have a win and a loss each with Ecuador having the advantage with even goal differentials. Ecuador could qualify with a simple 1-0 win over France. If Switzerland were to win too, its win would have to be over three goals at least. The only way Switzerland can advance with something as little as a 1-0 win is if Ecuador loses or ties France on Wednesday. Honduras has slim chances of qualifying but the chance is there. They would have to have a big win over Switzerland–like 4-0 or 5-1– and Ecuador would have to lose to France. No ifs, ands or buts. Argentina’s two wins may be unspectacular but their 2-1 win over Bosnia and their 1-0 win over Iran guarantee they will advance to the Round of 16. Bosnia unfortunately is out. So the most they can do in their match against Iran on Wednesday is win for pride. Nigeria and Iran both still have a chance with Nigeria having the advantage with a win and a tie. Nigeria could advance by simply tying Argentina on Wednesday. Iran not only needs a win but Nigeria has to lose to Argentina completely for Iran to advance. Plain and simple. This is one group where all four still have a chance to qualify. Germany and the US are the two most likely due to them having both a win and a tie. Portugal has the slimmest chances but they’re still there. They have to have a big win against Ghana and for either of the other two to lose badly in their match to have a chance. Ghana can also make it in with a win but it would have to come at the US losing. They only way Ghana could advance with Germany losing is if Germany loses to the US 5-0 or 6-1. Germany and the US can simply advance just by tying. The US’s chances are good but not solid. As I mentioned before, they could be out if they lose and Ghana has a win. Thursday is the day everything will be decided. Belgium is the one country right now that’s guaranteed a berth in the Round of 16 with their wins of 2-1 against Algeria and 1-0 against Russia. While the other three countries still have a chance ,the country with the best odds is Algeria upon their 4-2 win over South Korea. Their win was big enough so that they could advance by simply tying Russia. Only if South Korea won over Belgium 3-0 or 4-1 would that ruin Algeria’s chances. However Russia can still have a chance. They have to have nothing less than a win over Algeria for them to advance. It would only take a big win from South Korea to prevent Russia from advancing upon a win over Algeria on Thursday. Wonder why all four teams play their last Group Stage game simultaneously? It had its origins at the 1978 World Cup. It didn’t happen in the First Round Group play but in the Second Round of group play. This was when the Top 2 from each group advanced to a second round of group play. Winners of both groups played in the final for the Cup. Second-place in both groups played for third-place. Brazil played their last match 2 1/2 hours before hosts Argentina was to play theirs. Brazil won over Poland 3-1. That sent the message to Argentina they’d need to win over Peru by at least four points to qualify for the final. And they did it: 6-0. Argentina eventually won the Cup. That led FIFA to pass a ruling that all teams in a group play their last Group Stage match simultaneously. And there you go. That’s what’s needed in terms of advancing to the Round of 16 starting on Saturday. I’m sure it will be crazy shifting your attention from one game to the other but don’t worry, the other will eventually get replayed.